Performers include: Melissa Gilbert, Lindsay Greenbush, Sidney Greenbush, Michael Landon,Karen Grassle, Scottie MacGregor, Richard Bull, Jonathan Gilbert, Melissa Sue Anderson, Kevin Hagen, Alison Arngrim, Matthew Laborteaux, Dabbs Greer, Dean Butler, Victor French, Wendi Turnbaugh, Brenda Turnbaugh, and Ruth Foster. Based on the books by Laura Ingalls Wilder, this family drama tells the story of the frontier Ingalls family. The series begins with farmer Charles Ingalls (Michael Landon), his wife Caroline (Karen Grassle), and their three daughters — Mary (Melissa Sue Anderson), Laura (Melissa Gilbert), and Carrie (Lindsay and Sidney Greenbush) — moving to farmland in Walnut Grove, Minnesota. While working the land and struggling to make ends meet, the family remains committed to their strong moral values. They are befriended by a number of townspeople including burly Mr. Edwards (Victor French), loyal farmer Jonathan Garvey (Merlin Olsen), kindly Reverend Robert Alden (Dabbs Greer), town founder Lars Hanson (Karl Swenson), and sympathetic physician Hiram Baker (Kevin Hagen). The Ingalls shop at the general store of Nels Oleson (Richard Bull) and often come into conflict with his nasty wife Harriet (Katherine MacGregor) and spoiled children Nellie (Alison Arngrim) and Willie (Jonathan Gilbert). The Ingalls later adopt three more children; Albert Quinn (Matthew Laborteaux), and James (Jason Bateman) and Cassandra Cooper (Missy Francis). 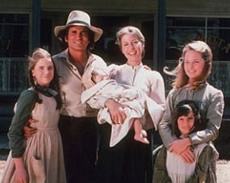 Other characters include Mary’s blind husband Adam Kendall (Linwood Boomer), Laura’s husband Almanzo Wilder (Dean Butler), Almanzo’s orphaned niece Jenny (Shannen Doherty), the Oleson’s adopted daughter Nancy (Allison Balson), and the Carter family — patriarch John (Stan Ivar), wife Sarah (Pamela Roylance), eldest son Jeb (Lindsay Kennedy) and younger son Jason (David Friedman).